Interested to hear from artists and residents themselves on co-creating public artwork for MacPherson? Join us for the ARTS TRAIL @ MACPHERSON where the public will rediscover treasures of the MacPherson Neighbourhood and be charmed and inspired by stories from both artists and residents. This trail explores the works co-created with MacPherson Residents on Pipit Road as well as the seniors from Geylang East Home for the Aged (GEHA). Explore the stories behind the artworks, and the many memories of MacPherson shared by our residents and seniors at MacPherson. 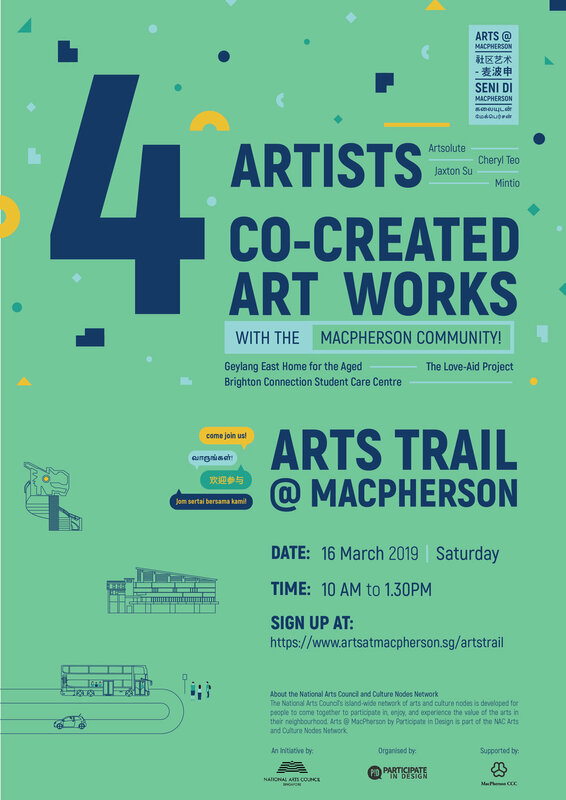 This trail explores the works co-created with MacPherson Residents including the seniors, hawkers and children from Brighton Connection Student Care Centre. Be charmed by the heartwarming art piece celebrating the community’s creativity and MacPherson’s hidden gems. The meeting point will be at the drop off point of Macpherson Community Club. How early do I need to arrive at the meeting point? Please be at your signed up session at least 15 minutes before the start of the session. Do I need to pay for the trail? The arts trail is free for the public! Do I need to be a resident of MacPherson to attend? No, all are welcome to attend! In case of inclement weather, please bring an umbrella or poncho. The tour will proceed rain or shine. Dress simply and wear comfortable shoes for a better experience. You may bring a water bottle as the weather may get hot. Will there be lots of walking required? What language will the tour guide be speaking? The tour will be in English. If you would like to make an arrangement for the tour to be translated, please note the request in the sign up sheet above. What can I expect from the trail? Each trail will bring you to visit 2 public art installations which is part of the Arts@MacPherson programme. Artists will do a sharing of the project, followed by an interactive activity with the public at each location curated by our artists and organisers. Come with an open mind and have fun! By agreeing to join the trail, each participant shall be responsible for any injury, loss or damage due to carelessness of other actions on his/her part or that of children under his/her charge. It is compulsory for a parent/guardian to accompany any child under the age of 12. Please provide full name as public liability insurance will be purchased for all participants. Kindly be at the meeting point 15 minutes before your start time. See you!